One of our most frequently asked questions comes from the legions of CorelDRAW users. They have grown fond of their graphic design software and want to know if we have a vinyl cutter that can output their designs directly from CorelDRAW. The short answer is Yes. The longer blog-worthy answer is Yes,… but. Meaning Yes, but why limit yourself? Yes, but you can get a working solution for a lot less. Got your attention? Good. Let’s find out more about affordable CorelDRAW vinyl cutting solutions. For those who are unfamiliar, CorelDRAW is the flagship product of Corel Corporation, the makers of PaintShopPro and Word Perfect. DRAW, as the Corel people call it, is their vector design application. It’s a very popular graphic design program because it’s relatively inexpensive and easy to learn. These two traits make it much more widely used than its chief rival, Adobe Illustrator. Illustrator is the desktop publishing industry standard and the choice of degreed graphic design professionals. Why are we talking about Illustrator in a CorelDRAW blog article? More on that in a moment. Because so many people have learned to use CorelDRAW, there are lots of them who discover vinyl graphics and decide they’d like to continue using their familiar software for their vinyl sign & hobby projects. It’s not a bad idea because CorelDRAW is a vector design application. And, as John Coley and I discussed in our recent Q Series Webinar, vinyl graphics are vector graphics; images made of paths and points. So you can definitely create simple vector designs in DRAW that can be cut on a vinyl cutter. So it’s not a bad idea. But it’s not a great idea because DRAW has no drivers for vinyl cutters. Neither does Illustrator for that matter. Neither flagship vector design program can send vector art to your R31, EnduraCUT, Qe6000, Q24, or Silhouette. But there is a fix for this. Two actually. One solution is to purchase a vinyl cutter that comes with something called a plug-in. The other is a bridge. Plug-ins are little third party apps that add functions to someone else’s software. If you guessed that the legions of Corel users would be a natural market for a vinyl cutter plug-in you’d be right. All Graphtec and Roland vinyl cutters come with plug-ins that add cutter drivers to CorelDRAW. 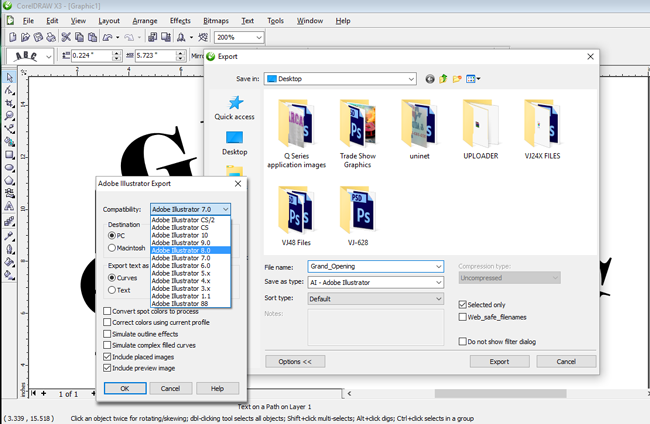 Graphtec’s plug-in is Cutting Master 3 which also works for Adobe Illustrator. Roland’s is called CutCHOICE. Cutting Master3 add a Cut-Plot function to the DRAW or Illustrator tool set so you can send files directly to the cutter. Cutting Master3 video tutorials are on Graphtec’s website. The problem is these cutters are excellent products with impeccable pedigrees. That means they’re also more expensive and out of reach for many customers. If a plotter with a plug-in is too pricey, you can use a bridge. A bridge is connects two applications and allows you to port data from one to another. We have such a product in our Vinyl Express LXi software. 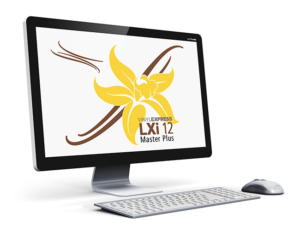 Make no mistake, LXI is much more than a bridge for Corel users. It’s a fully-functioned, feature-laden, vector graphic design solution based on over 30 years of experience in the sign industry. But since it comes from SIGNWarehouse, it’s also designed to offer outstanding value. One of the ways LXi offers outstanding value is through variety. Rather than a ‘one size fits all’ approach, we offer different levels for designers with different needs. For those who want a complete sign design package, we offer LXi Master Plus, which can satisfy the needs of any vinyl sign business. But for those die-hard CorelDRAW users who just don’t want to learn a new application, we have a bridge in LXi Apprentice and Expert. 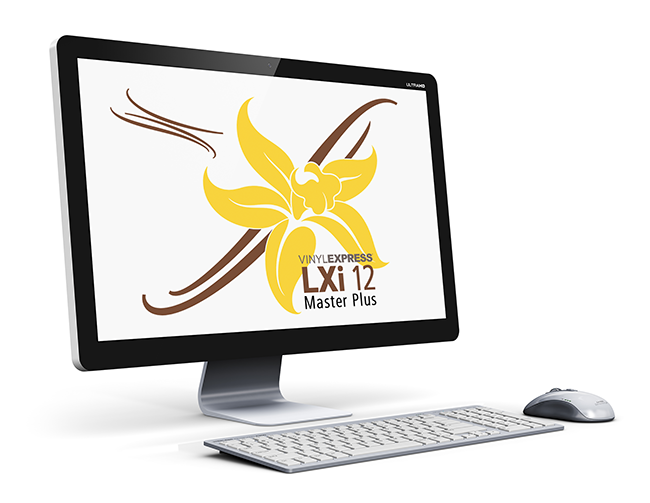 These entry-level LXi products have all the powerful plotter drivers and controls you need to get the most out of your hardware. Yet they let you import files from your favorite software. Here’s how it works. Fig 1: Export your art as an .AI file. 1) Design your graphic in CorelDRAW. Export it as an .EPS or AI file. AI stands of course for Adobe Illustrator. Illustrator is the standard file format used in the industry, so it’s the language needed to get your data across the bridge to your cutter. If you have the option, export it in an older version of AI such as Illustrator 8.0 (Fig 1). The newer the AI format, the more likely there will be incompatibilities in the language. Keep it simple. EPS stands for encapsulated postscript, which is another Adobe file format. Either one will work if managed correctly. 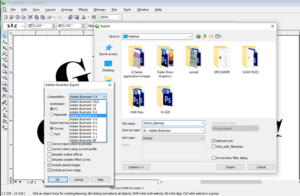 2) Open LXI Apprentice and click File/Import. Search for the .AI or .EPS file and select and open it to bring it into your LXI workspace. Now you can edit it or just send it directly to your Vinyl Express R Series, EnduraCUT, or Q Series plotter. 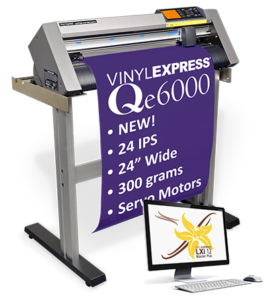 Selecting LXI Expert with a Vinyl Express Qe6000 or Q Series cutter gets you all the quality and capability of a brand name cutter without the pricey pedigree. Plus you get an impressive package of startup essentials to help you succeed: all for a lot less money. If you’re not sure which vinyl cutter is right for your needs, please click here to access our Cutter Comparison Guide. So if you’re looking for a vinyl cutter you can use with your existing CorelDRAW software, we have solutions for you. 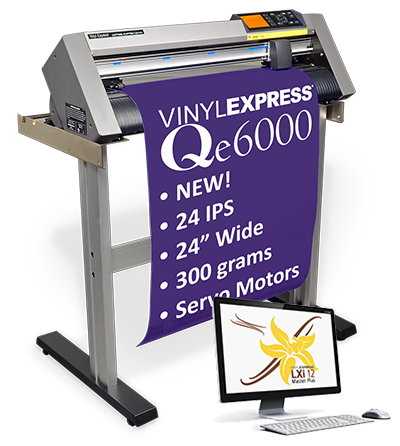 You can take advantage of Vinyl Express value with an R Series, EnduraCUT, or Qe6000 cutter, or opt for the pricier plug-in plotters from Graphtec and Roland. Either way, the answer to your CorelDRAW question is Yes.